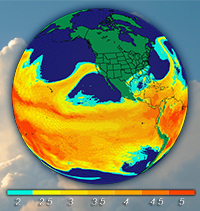 PNNL scientists are helping global climate models more accurately predict the movement of atmospheric rivers, which carry as much as 90 percent of the world’s moisture from the tropics to the poles. In this view, from the band of moisture circulating in the atmosphere around the tropics, a large atmospheric river is stretching toward the California coast for what appears to be a powerfully wet storm. Enlarge Image. Results: Long and concentrated bands of water vapor originating from the tropics stretch toward the North American west coast, often causing heavy precipitation and flooding when they hit. Today's climate models may be swimming against the current when it comes to helping researchers understand these atmospheric rivers. Now, scientists at Pacific Northwest National Laboratory have found that the number of simulated atmospheric rivers decreases as the model increases in resolution. As reported in the Journal of Climate, accurately capturing the frequency of these extreme events hinges on the model's realistic simulation of atmospheric moisture amount and sub-tropical wind positions, among other large-scale environmental conditions. Their results may provide that much-needed watershed moment to improve the way the models handle extreme precipitation events. "This study highlights important links between how a model simulates large-scale conditions and extremes," said Dr. Samson Hagos, the PNNL atmospheric scientist who led the study. "The results will help us improve the modeling of extreme rainfall associated with atmospheric rivers and interpret their future in a warming climate with greater confidence." 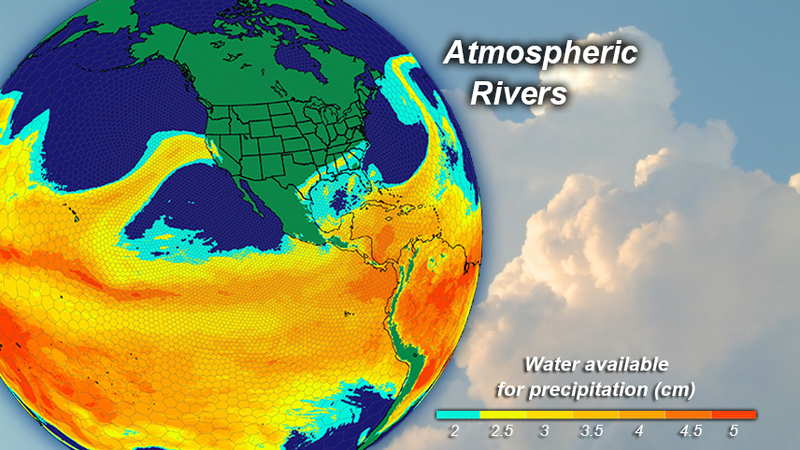 Why It Matters: Atmospheric rivers are a bad news/good news story. Though blamed for major flooding, people living in the western U.S. depend on them for the rainfall and snowpack to supply drinking and irrigation water. Often described as an atmospheric conveyor belt of rain, they carry up to 90 percent of the global moisture moving from the tropics toward Earth's poles. In a typical winter, a few atmospheric rivers can account for up to 50 percent of the annual rain and snowfall in California alone. With accurate modeling of atmospheric rivers, scientists can improve weather prediction today, and prediction of future climate changes in specific regions of the globe. That's good news for farmers and water managers who must plan for the next several years and researchers striving to learn what's in store for the planet under climate change in the decades to come. Methods: The researchers started with two variations of version 4 of the Community Atmosphere Model (CAM4) that differed in the way the model grids were represented (called their resolution). These variations included either the Model for Prediction Across Scales (MPAS) or the High-Order Methods Modeling Environment (HOMME) as part of CAM4. Scientists ran the models at resolutions ranging from large (240 kilometers) to small (30 kilometers) in two scenarios: an idealized planet composed entirely of ocean and a real world that included land. By comparing the results from the two variations and scenarios, the researchers were able to identify reasons why the models struggled to predict the frequency of atmospheric rivers. Key to the problem was the handling of large-scale weather conditions, specifically the amount of moisture and the location of sub-tropical winds. What's Next? Based on the results of this study, scientists are examining a large set of 160 year-long climate model simulations. The researchers will study the processes that could determine the future frequency of atmospheric rivers in a setting that includes the effects of greenhouse gases. Sponsors: The U.S. Department of Energy Office of Science, Office of Biological and Environmental Research supported this work as part of the Regional and Global Climate Modeling Program. Facilities: The National Energy Research Scientific Computing Center provided computing resources for the model simulations.